There for you in the morning rush, and waiting for you again at the end of the day to unwind, the master bath vanity wears many hats for your needs. Not all vanities are created equal, however, so when you are considering changing yours, there are several important questions to discuss with your partner and designer. A great vanity, one that works for you and brings the right level of aesthetic flavor to your space, is an important cornerstone to having a bathroom you love. Separate vanities in this master bathroom remodel in Sharonville. "His and Hers" or Separate Vanities? For couples sharing a bathroom, the first question to address is whether or not you would prefer to share one vanity. Some couples enjoy having his and her vanities to have the space to spread out and have their own vanity to do with as they please. In such cases, a shared vanity may not be the ideal solution. If there is space in the bathroom and the plumbing considerations are cost effective for your budget, working in two vanities is a great option. A separate vanity may also be called for if a make-up or grooming area is desired. A double sink vanity in a West Chester master bathroom. If you would prefer to have a single vanity (or if space limits you to just one), the next important question to ask is if you would like the vanity to hold one or two sinks. For some couples, timing works out appropriately so that each person can use the same sink without being in the other person's way. In other cases, having two sinks, like two separate vanities, provides a bit of "personal space" in the shared room. To know whether a single sink vanity is the right choice or not, pay attention to the way you and your partner use the bathroom together, and when or if you end up trying to occupy the same space at the same time. 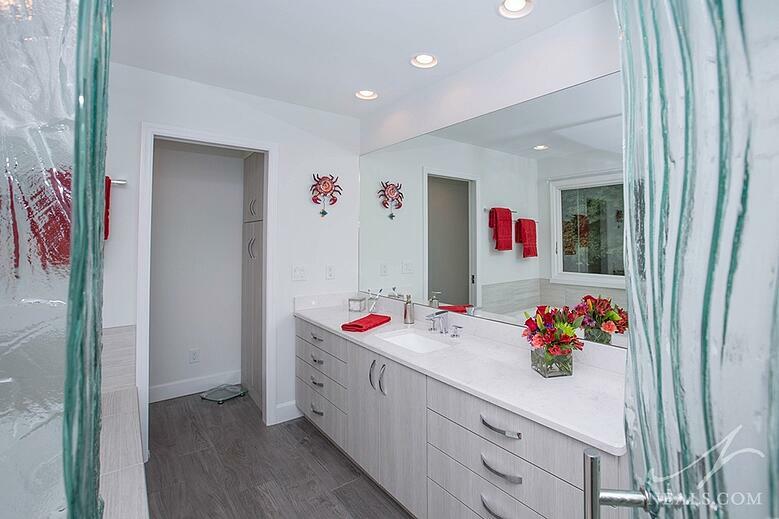 Some master bathrooms are going to be too small to accommodate anything other than a single vanity with one sink. In those cases, if it's a shared bathroom, the following questions are going to be much more important to the overall success of the vanity for you both. 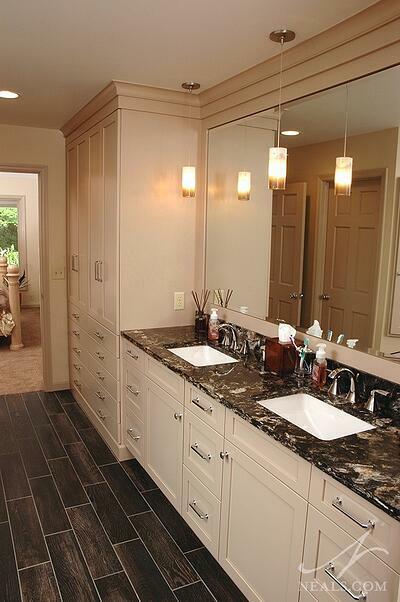 Storage on the counter offers a boundary between the two sinks in this Cleves bathroom. Not all vanities are going to need storage. 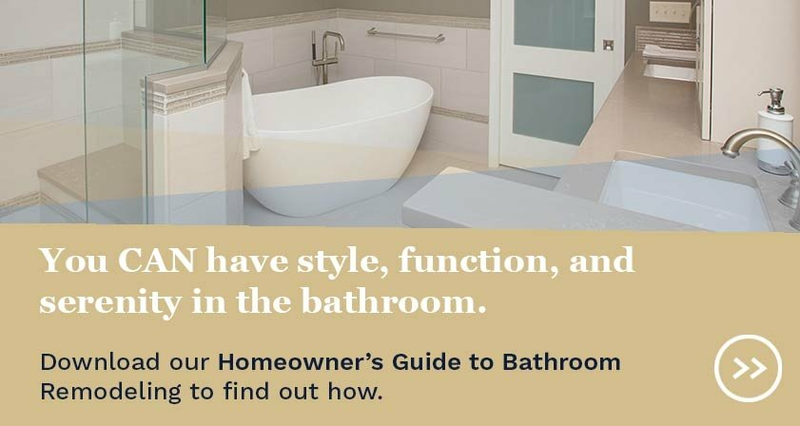 Some bathrooms can be outfitted with additional cabinetry, medicine cabinets, or closets that hold the majority of bathroom items. For these bathrooms, the vanity can be a stylish pedestal or floating sink. When storage space is at a premium, however, or when having storage at the sink is more efficient for the homeowner, there are hundreds of options. Traditionally, vanity storage is placed under the counter, in a combination of cabinets with interior shelving and drawers. It's also possible to place a half-depth cabinet above the counter. This is great for double vanities, as it serves as a visual boundary between the two sinks. To get the most out of the storage space, consider what you need close at hand, and how you want to access it. From there, think about longer-term storage (extra tubes of toothpaste or bottles of shampoo), bath linen storage, where your grooming kit or hair accessories can live if needed, and how much of your stuff you would like out on the counter. 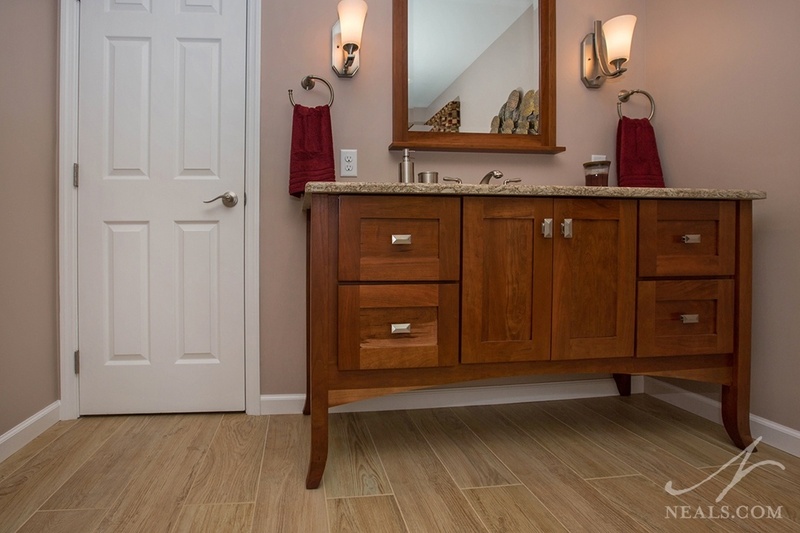 When looking at where your storage will go, think about the overall style of the vanity. In addition to a cabinetry unit that sits on the floor, you may also wish to look at furniture-style vanities (either custom built units or furniture conversions), or for a modern look, floating cabinets that leave an open space on the floor under the vanity. Furntiure-style vanity in a Mason master bath. Modern bath design has facilitated the evolution of the bathroom sink from the standard drop-in unit to a variety of vessels that can convey a style or theme nearly on their own. The above-counter vessel bowl sink is a beautiful style option, but it comes with its own set of considerations and maintenance requirements. In recent decades, the under-mount sink has become a go-to for bathrooms. Cleanup is easier with this type of sink, since there is no barrier or lip between the bowl and the counter. Bathroom sinks also do not need to be large, which can provide some leeway and options for placement on the vanity. The type of faucet bears thought as well. Vessel bowls require a taller type of faucet, which may end up being a limited choice for you and your budget. Beyond that, bathroom faucets come in several varieties that each bring a different usability and style to the table. A single-levered faucet is great for when your hands are covered in soap. Two separate water dials are good when you like to find that perfect temperature. Different faucets also convey different design aesthetics, and a modern-looking faucet in a traditional bathroom can easily ruin the room's overall design. 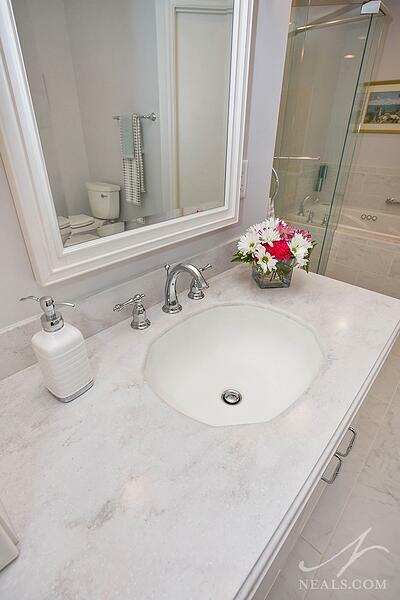 A Corian counter in Raincloud gives this Hyde Park vanity a soft, textured look. If you are opting for a vanity with a counter (instead of anything like a single-piece pedestal), then you will need to select a countertop material. In very technical terms, the term "vanity" actually applies to the combination of cabinet and countertop in the bathroom. Just like in the kitchen, some counter materials are going to be better choices in terms of maintenance and bathroom application, while others are going to have higher maintenance requirements but offer greater design appeal. Granite and quartz are ideal options that come in a huge variety of colors to work with almost every design scheme. A solid surface material, such as Corian, is another option. Solid surface materials have seen improvements in the last few years as the changing technology has made more natural colors easier to achieve. 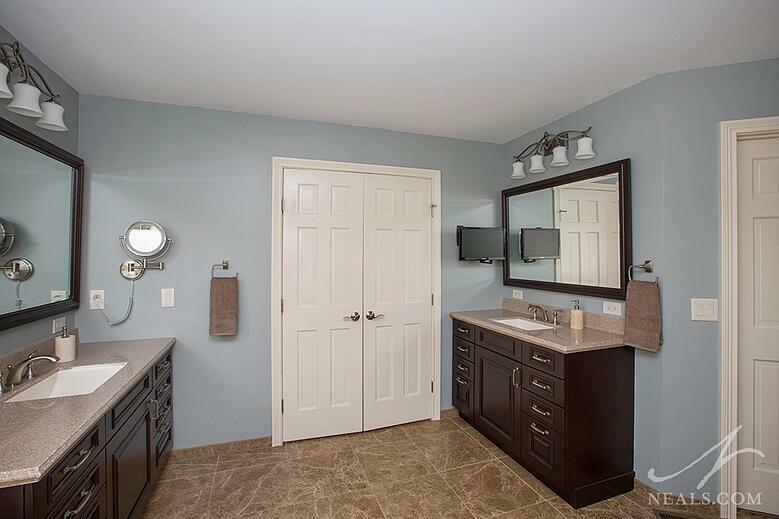 A large mirror over the long vanity in this Sycamore Township bathroom is a great option for multiple users. One of the last things to consider when designing a new vanity is the mirrors and lighting above it. 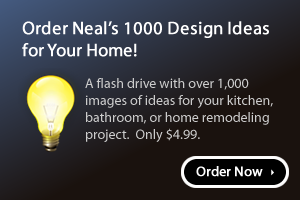 The bathroom sink is one area in the home in which proper task lighting is critical. The right amount of lighting can come from recessed can lighting in the ceiling, or sconce lighting around the mirror. Sconce lighting is a great way to add more style, and can often be matched to other types of light fixtures to create a cohesive theme around the bathroom. When it comes to mirrors, the style of the vanity is going to dictate a bit. 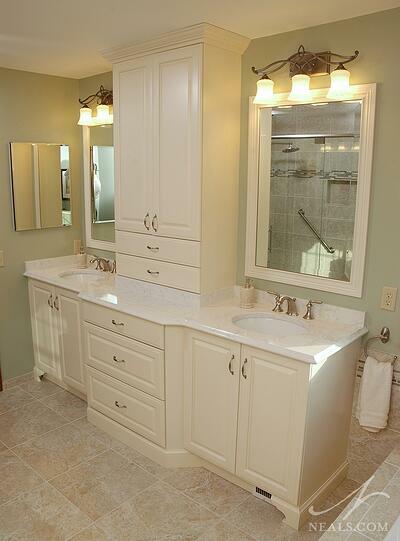 For example, if you have a double sink vanity with a storage cabinet in between you will need two mirrors. If it's a single sink vanity, one large one should suffice. Consider whether the mirror should double as a medicine cabinet, or if you'd like it in a nice frame. Mirrors can also be outfitted with lights for additional illumination. The bottom line is that a mirror should work for both users, so size and height position on the wall should be the first considerations.